Gold and gold stocks are acting well. And that's probably going to continue for a while. You see... as the broad stock market started to sell off in October – and it appears, at least to me, the S&P 500 has entered a prolonged downtrend – the gold sector made a bullish move. It now looks like the sector as entered a prolonged uptrend. 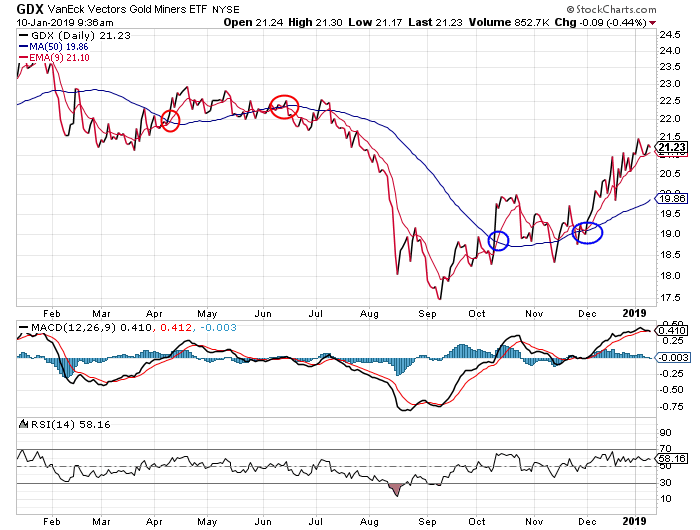 In early October, GDX rallied above its 50-day moving average (MA) (the blue line on the chart). Even more important, the 9-day exponential moving average (EMA) (the red line) crossed above the 50-day MA as well. This "bullish crossover" often marks the start of an intermediate-term rally phase. Of course, the buying interest that creates the "bullish crossover" also creates short-term overbought conditions in the stock. You can see how GDX spiked sharply above its 50-day MA in early October. You can also see how GDX traded back down to its 50-day to retest that level as support and to work off the overbought conditions. Notice, though, how the 9-day EMA drifted back down to the 50-day MA as well. This action usually provides an excellent opportunity to buy a position in anticipation of a rally. If the 9-day EMA bounces off of the 50-day MA, then the stock is headed even higher. On the other hand, if the 9-day EMA drops below the 50-day MA, then it creates a "bearish crossover." In that case, traders can then exit their positions for a small loss. The red circles on the chart show how a similar setup last April-June failed to kick-off an intermediate-term rally. This time, though, the setup looks good. GDX is a little extended in the short term. The 9-day EMA is a bit too far above the 50-day MA for me to be willing to add more gold stock exposure right here. But, I would look to buy GDX on a pullback towards its 50-day MA – or if GDX can just chop around for a couple of weeks and give the 50-day MA enough time to rally up towards the current price of the stock. Crux note: No matter which direction the markets go, Jeff Clark's Market Minute subscribers are always up to date on the trends taking shape – and the best ways to profit on them – hours before the opening bell rings. Sign up for the Market Minute for free right here… and get your next issue at 7:30 a.m. sharp tomorrow morning.